Skyline Country Club is a Tucson classic. It is one of the first two country clubs in town, built in 1962 at the top of Tucson and is fully owned by its members. The membership has kept the top of the line quality with major remodels in 1984 and again in 2009. The 59,000 square foot clubhouse was built on the site with the best city views anywhere in Tucson. 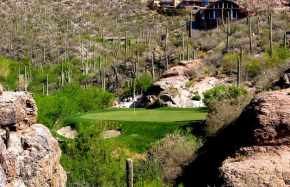 High in the central foothills of the Catalina Mountains, is a gem of a golf course meandering through the hills and valleys with wonderful views of the spectacular cliffs above the course and the city below. The Skyline Course is a stern test of golf for 6,123 yards. You will get to use every club in the bag on 6 doglegs right and 4 doglegs left, with both uphill and downhill fairways. It is not unusual to see deer, javalina, coyotes and even bobcats as well as a wide range of birds from hawks to quail. You may use a club golf cart or walk and carry your bag or use a pull cart. The practice facility includes a 220 yard driving range, a chipping green, practice bunker and practice putting green. The greens are bent grass and the fairways are bermuda, overseeded with winter rye. The greens are nicely undulated and are smooth and true. Chris Dompier, head professional, has numerous golfing groups that you may join and also offers private lessons and clinics. The course is kept in wonderful condition by Gary Slone, who has maintained this course in pristine condition for the last 18 years. The golf shop has several lines of men’s and women’s golf attire as well as the best equipment available. The staff is trained to help in new club fitting to benefit your individual swing. Typical rounds of golf are 4 hours or less. Skyline Country Club has been chosen as one of the top 200 private clubs in the country by peers in the industry in designating the club as a Platinum Club of America. A wall of windows with 180 degree views across Tucson await those who work out at the fitness center which had a major remodel in 2009. A wide range of cardio machines, elliptical trainers, weight training stations and free weights are available as well as a wide range of fitness classes offered for every exercise level. An Olympic size swimming pool is situated on the west side of the Clubhouse and offers a great place to watch sunsets. It is heated year around and uses a saltwater filtration system so that strong chemicals are not necessary to treat the water. Regular water aerobic classes are available as well as lap swimming. On the east side of the Clubhouse are 6 clay tennis courts which are very rare in Tucson. Many tennis events are scheduled throughout the year including playing other country clubs, playing with the U Of A tennis team, a Margarita mixer, invitationals for all levels, and women’s, men’s and mixed tournaments. The dining choices are many and varied at Skyline Country Club. The “19th Hole” serves everything from hamburgers and salads to filet mignon in a casual atmosphere with 2 high def plasma tv’s and a walkup bar. Also on the lower level of the Clubhouse, all with views of the city are The Bistro and The Galleria. Fine dining is held in The Rotunda with amazing city light views with true gourmet cuisine. All dining is prepared by a culinary team guided by Chef Issa Moussa who has made Skyline famous for its dining experiences for over 30 years. Banquet facilities are available from intimate rooms for small groups under 30 to The Skyline Room which seats 340 persons as well as the Outer Lower Terrace which seats up to 250 people with incredible views of the city.